The Altamont Hotel was located on what is now Crown Avenue, and was nationally known for its mineral waters. It was later used a hospital for soldiers. 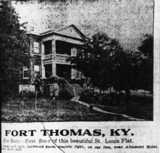 Other mineral water resorts in Fort Thomas included the Avenel, and the Shelley Arms. from The Druggists Circular, Vol. 53, 1909. Thanks to Eric Geiman for these. These are both views of the Cincinnati Waterworks, in California, Ohio. The Altamont is the building high on the hill in the background of these. By the 1920's business had declined, and the Altamont was sold at auction. Story here.